Pte. 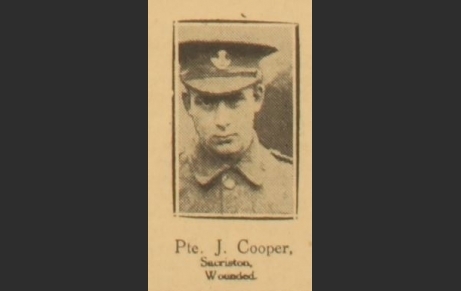 J. Cooper, from the Chester-le-Street Chronicle, 14 July 1916, courtesy of the Sacriston Heritage Group. John Cooper served with the 18th Battalion Durham Light Infantry – the Durham Pals. He enlisted on 17 September 1914 as a 18/466 Private Cooper and was wounded sometime during the summer of 1916, possibly on 1 July – the first day of the Battle of the Somme. John Cooper recovered from his wounds and continued to serve. He was later promoted to lance corporal. He was finally discharged on 17 October 1919. Reported wounded in the Chester-le-Street Chronicle, 14 July 1916. Medal(s): 1914-15 Star, British War Medal, Victory Medal.